HH&S Director Kate Folb moderates panel at the Morelia Film Festival; Lorena Guillé-Laris, executive director of Cinépolis Foundation; Telemundo writer Indira Paez (seated third from right) with members of her breakout group; main boulevard at night; poster for festival. 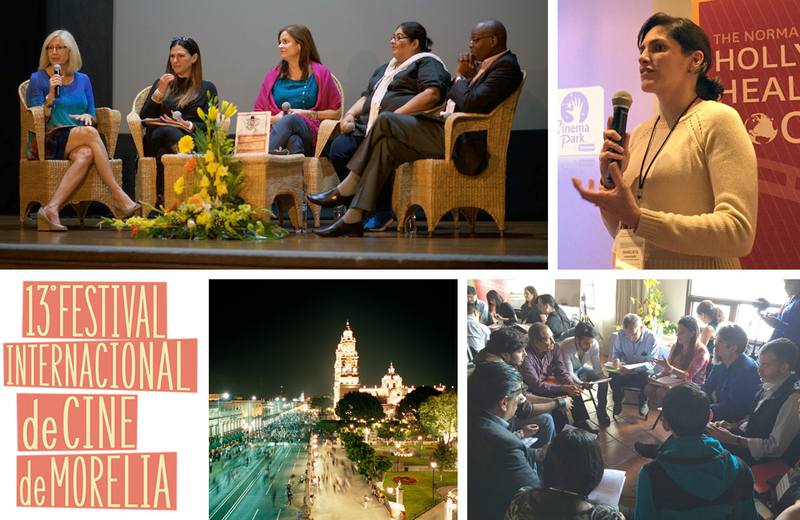 In partnership with the BMGF and the World Bank, HH&S brought a group of international TV and film writers to the 13th annual Morelia International Film Festival (FICM) in October 2015 to participate in a panel discussion about storytelling and health, and to lead a workshop with writers in attendance. The festival was founded in 2003 as a way of promoting new trends in Mexican cinema—with the city of Morelia as its main venue—and to contribute to the cultural and touristic activities in the state of Michoacán. FICM attracts over 60,000 TV and film professionals. On the first day, panelists from Hollywood, Health & Society, the World Bank and Cinépolis Foundation discussed entertainment education (EE), showcased best practice examples in TV and film and highlighted their own experiences in the creative process in crafting public health messages. Participants learned about the power of entertainment to successfully raise awareness and influence behavior. The following day, an interactive workshop focused on accuracy in storytelling in keeping viewers engaged. The three-hour session included plenty of feedback from professionals, and sharpened storytelling skills by showing participants how to select key aspects of subject matter for dramatic effect. Kate Folb, director of Hollywood, Health & Society, and Johanna Blakley, managing director and director of research at the USC Annenberg Norman Lear Center, were among the workshop presenters in evaluating the impact of entertainment education on viewers' behavior and attitudes.